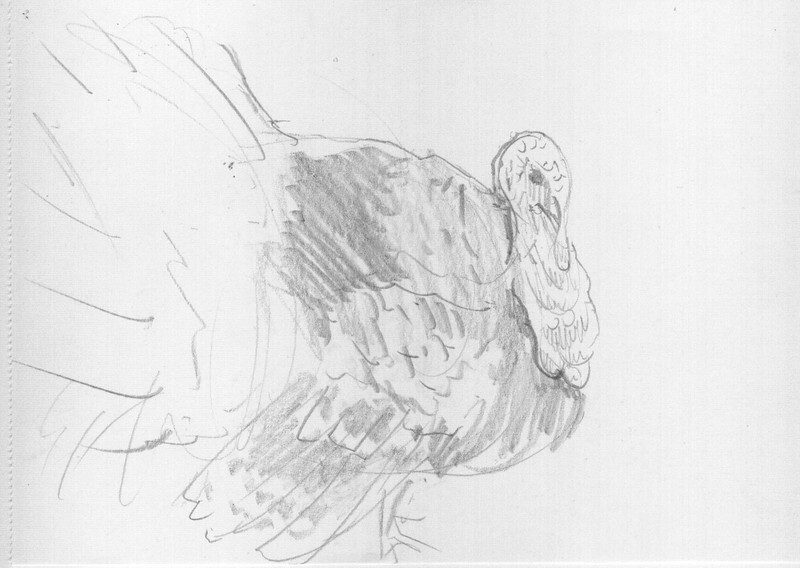 This is another 'quick sketch' done of a very handsome and talkative turkey. Let me rephrase that to a 'very, very talkative turkey.' A very 'loud, talkative, turkey'. It's fun to get into the pattern of, 'walk' 'stop' 'draw', repeat.... especially if your hand work is a bit rusty. It really helps to just let yourself 'loosen up' when done with the right attitude. Just capture something of your subject, no pressure to make it photorealistic, move on to another subject. You start making more judicious markings on the paper with the time you do have. Even when the drawing is really rough, you can still capture 'an attitude', or the basic essence of the animal.